No matter the size of your donation, you can be assured that it will make a tremendous difference in the lives of many veterans and their families. 100 percent of all donations received will go towards helping these homeless veterans and providing scholarships to their children and other deserving students. 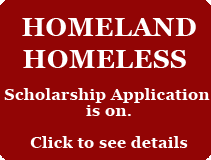 Our goal is to reach out to all homeless veterans including those on skid row. 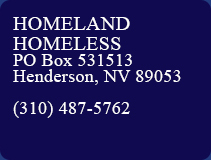 Homeland Homeless is recognized as a tax exempt organization under section 501(C) (3). Therefore, all donations are tax deductible.